(Photo: WCC / Peter Williams)The Archbishop of Canterbury Justin Welby giving his massage to the World Council of Churches 10th Assembly in Busan, South Korea, on November 1, 2013. UK government officials lack "religious literacy," and are therefore likely to view Evangelical Christians as extremists, the spiritual leader of the Church of England and the most senior bishop in the Anglican Communion has said. Dr. Justin Welby, the Archbishop of Canterbury, said that government officials often do not recognize a distinction between Islamic militants and traditional Christians, and are likely to see both groups as "a bit bonkers." 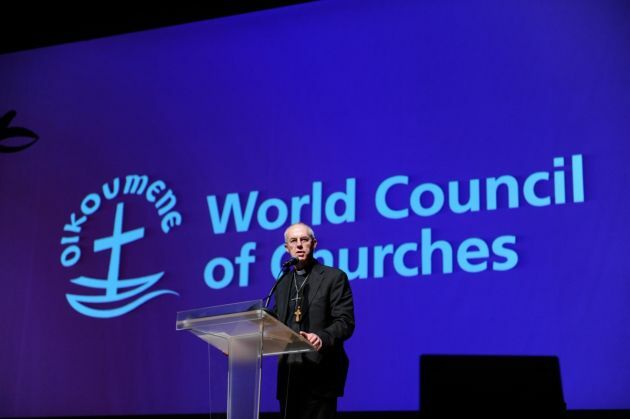 "It's fine to reject and condemn many of the things done in the name of religion but you still need to understand what it is that can so catch hold of someone that they think life itself is not worth living if that contradicts what they believe," said Welby, Catholic Culture reports. The archbishop is a man who knows the secular world having spent years in corporate leadership in the banking and oil industries before turning to the Anglican priesthood. The government thinks conservative Christians are 'extremists', says Welby who warned that UK government officials know so little about religion that conservative evangelicals would be counted as extremists by their own definition, reports the Catholic Herald. His comments came in an address to head teachers of a Church of England school in the Anglican Diocese of Bath and Wells in the west of England. Britain's Telegraph newspaper quoted Welby as saying: "Our government generally is desperately trying to catch up, to understand a world in which they have no grip on what it is to be religious at all." The archbishop said, "The Foreign Office, the Ministry of Defense, our government generally, is desperately trying to catch up, to understand a world in which they have no grip on what it is to be religious at al." Welby said, "Where religious illiteracy is prevalent and extremely destructive of understanding and where they can't see really the difference between an extremist Muslim group like the Muslim Brotherhood and a sort of conservative evangelical group in a Church of England church." He went on to highlight the rise of religiously motivated violence, which he said is reaching levels not seen since the aftermath of the Reformation some 500 years ago. Welby also highlighted the rise of religiously motivated violence, said the Telegraph reporting that the archbishop said this is now at the top the agenda in a way it had not been in Britain since the aftermath of the Reformation. But while it is an issue which he has to confront virtually every day in his position, many in the Government appear to be struggling to understand it, he said.